I see you, military girlfriend. You don’t think anyone notices. Maybe you don’t think you’re “important” because you’re not “official.” There’s no ring on your finger. 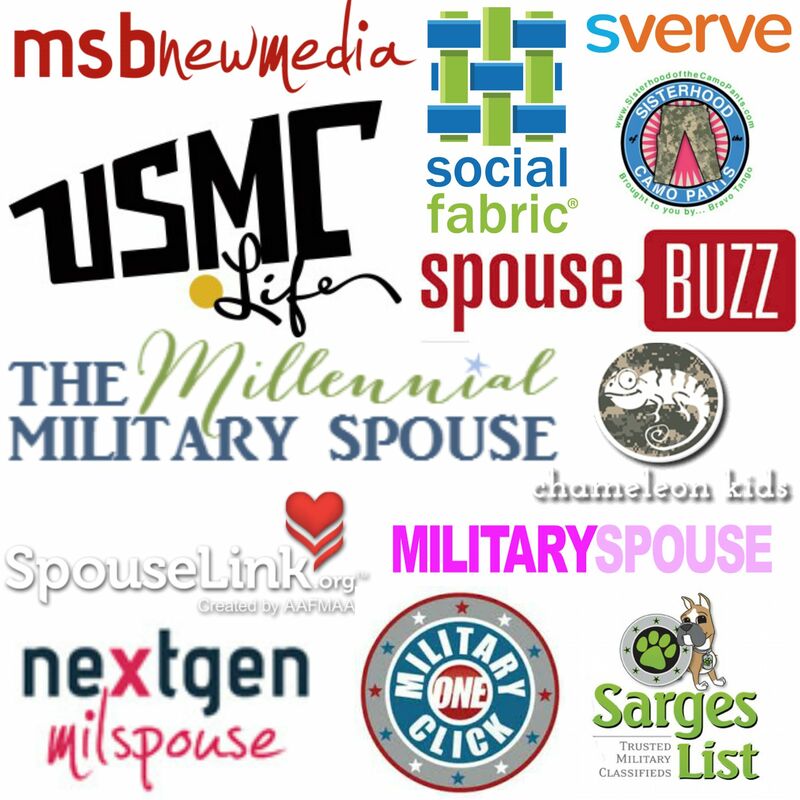 Maybe you feel like you don’t really exist in the military community. Maybe you think that spouses– even ones just married a little while ago– might think less of you, overlook you, or be mean to you. You’ve heard the stories. Maybe you don’t want to make waves. Maybe you’re just shy. 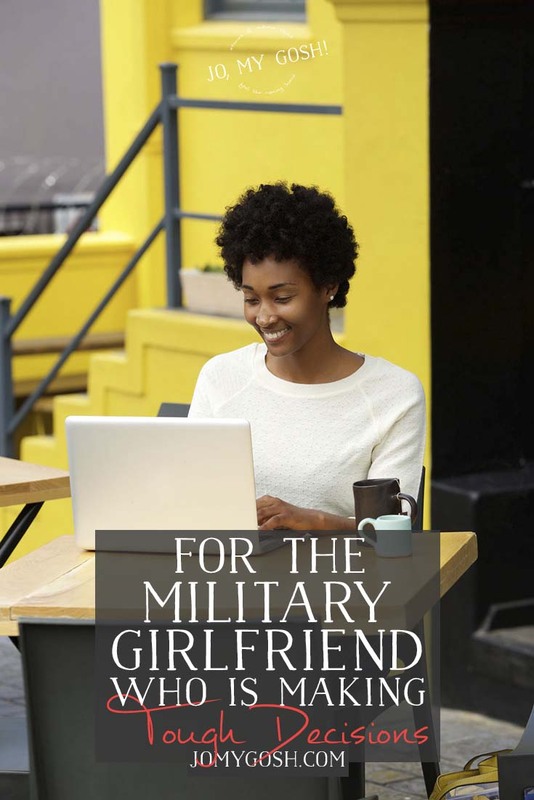 Maybe you don’t want to be “just some military girlfriend.” Maybe you don’t want to label yourself. But I want you to know that I see you. I see you writing letters in a high school auditorium during study hall or typing out quick text messages during your coffee break. I see you answering the phone at awkward times because, no, you will not miss another call. 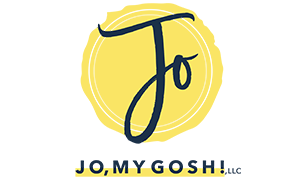 I see you making big decisions– huge decisions– about your life, about what you want from it while taking your military member into consideration. I see you searching Facebook groups for hours, researching the things you don’t understand, trying to find out more about the things you fear. I see you afraid to ask your partner’s coworkers’ spouses– worried that you might make yourself a target or might not be accepted. I see you stepping out onto a ledge and deciding to move across the country to be with them. Or choosing a grad school close to their current station. Or finishing college early to be close to them. I see you making the tough choice to stay long distance and finish your degree. I see you crying into your pillow at night or only allowing yourself to cry in the shower. I see you writing letters and sending care packages all over the world. I know exactly the kind of gut-wrenching pain the words “deployment” or “PCS” bring and knowledge that you cannot officially be part of some of the preparations. I know the confusion when you realize that the military culture is unfamiliar and the embarrassment that sometimes comes when you do something “wrong”. I know how tough it can be when you realize that this life might go on for 15, 20, or 30 years… and you aren’t exactly sure where your life may fit in it. I know the despair that comes with blacked-out communications during a deployment, knowing that if something happens, you won’t be the first to know. I know the utter relief that one phone call can bring. I see you because I used to be you. And I will never forget what it was like to be a military girlfriend. And I know that you can do this. You can make the decision to follow them across the country and step out on that ledge. You can make the decision to start school, even though it means you’ll be far away from the person you love. You can wait (maybe impatiently, maybe with a few tears and few dozen pints of ice cream). You can figure out military life and say “yes” if the question is popped with absolute certainty that you can make your life successful. You are strong. You are brave. You are welcome here. Thanks to Operation in Touch for sponsoring this content! Enter the Operation Cookie Swap sweepstakes every day from 11/28/16-12/27/16 for your chance to be one of FIVE lucky weekly prizewinners! Plus, each week, we’ll be featuring savings and a new batch of tasty treats to try–perfect for swaps and holiday care packages. This definitely hit home for me. My Sailor and I have been together 10 months and over 9 of them have been spend apart. Come March we will finally get to see each other regularly and the in October, I will officially be accompanying him to his next duty station ( and we don’t even know where that is yet!) I will be leaving my job, my apartment, my benefits, my stability for him because I can’t image going how many years just sharing my life with him through texts and Skype. I know my future is with him so I will make the hard and scary choices. I will start over. It’s terrifying, but exciting! Thank you so much for this. I read your blog very frequently. I love all your posts, they’re always so encouraging when I’m feeling down because no one I know understands what it feels like to have your fiancé thousands of miles away for months on end. So thank you for this. It really touched me. This was so nice to hear, I’ve been with my sailor for a little over eight months and I have only been able to see him for a total of three times during this. I miss him so much and I am currently working on my first care package for him of christmas, but it is proving to be more challenging than i expected, if anyone has some tips I would love to hear them! Spot on…made me smile, laugh and tear up at the same time haha. My boyfriend is gone now on his first deployment, crazy how some days you can think, “We’re going to get through this. We’re doing this,” while others you just want to give up. I’m surprised at the number of people who have told me it’s not worth it. But I think that anything worth having is worth fighting for! I’m sitting in class and just finished reading this.. and now I’m crying. This is as accurate as it can get, being a Marine’s girlfriend. I’m finishing my bachelors degree 10 hours away from his duty station and he is getting ready to leave for his first deployment (MEU) next week. I’m so ready for him to be back and for me to graduate so that I can move to be closer to him and get my masters degree there. It’s extremely overwhelming because you have no control over anything, the military pretty much makes every decision. But there is nothing that makes me more proud of him. I would love to find a way to get in touch so we can be support for each other. My Boyfriend is headed to boot camp in July and i am so nervous and stressed and excited for him to do all this. I would love to have some girls who have gone through this and are going through this on my side to talk to.